There are over 1000 chemical fume hoods on grounds in various laboratories that EHS surveys at least annually. These surveys are critical in determining whether or not the most important piece of safety equipment in a lab is performing satisfactorily. 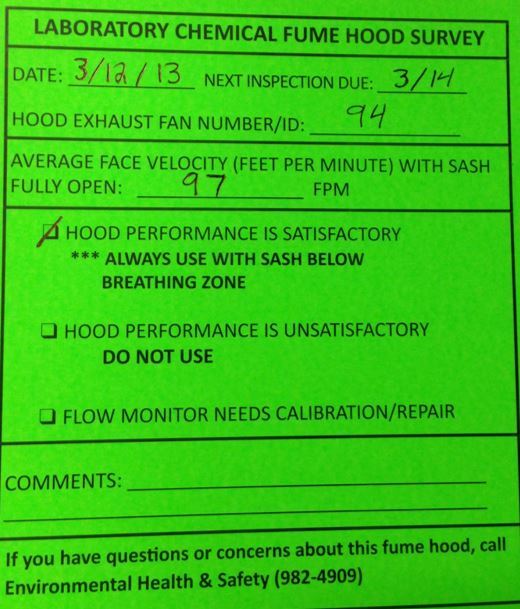 The sticker on the face of the hood (as seen in the example shown below) has instructions on how to operate the fume hood and provides contact information for repair or re-surveys. Modification of the local exhaust ventilation system without approval is prohibited, as changes made to the system may result in unsafe conditions.